It couldn't be easier to make this dish and it is ALWAYS a crowd pleaser. What's not to love? Sausage, corn, shrimp and potatoes and don't forget the corn bread! This time I added carrots because I saw it with carrots the other day at Cracker Barrel and thought "why not?" I follow a super simple recipe by my favorite all time cook Miss Paula Deen! Honestly it's so easy I don't even look at the recipe anymore! I really, I mean reheheally want to go to her restaurant in Savannah, Ga and I really want to stay at her cottage home on Tybee Island the "Ya'll Come Inn!" I also wouldn't mind a few pieces of furniture from her collection. OK yeah, I really love Paula Deen! 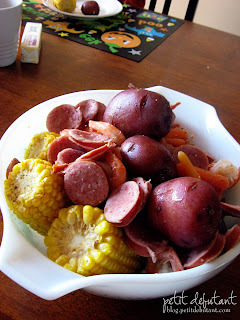 Labels: "low country boil" , "paula deen"
So what time should we come over? Mmmm that sounds delicious. I love a low country boil. se ve buenísimo! me encanta el elote amarillo! I had this at a wedding in South Carolina, and even to this Northwest Coast girl, we fell in LOVE with it! Thanks for the recipe!